PEOPLE who have travelled to work today should "stay where they are", Taoiseach Leo Varadkar has said. 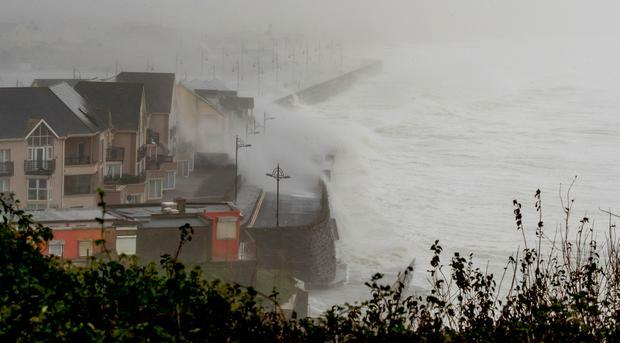 Speaking after meeting the team planning for the fallout from the storm, Mr Varadkar warned that even when Ophelia passes it will not be safe outdoors. "Even when the storm has passed there will still be dangers," he said, noting that trees will be blocking roadways and powerlines will be done. 3. Even if it seems calm now "it's coming your way"
4. There will still be life-threatening dangers after the storm has abated. It could be close to midnight before Ophelia clears the northern tip of the country. Mr Varadkar said the situation would be reviewed on an hourly basis. To date there are no reports of injury but around 22,000 homes are without power. ESB has lined up assistance from counterparts in the UK for the response. The Taoiseach said help will be forthcoming from Northern Ireland and Britain. Mr Varakar told reporters he had a concern that people think the storm may not be as bad as predicted. "People should stay indoors until the storm has passed," he repeated. OPW Minister Kevin 'Boxer' Moran told Independent.ie that he is particularly concerned about farmers who might feel the need to check on animals. He said they should not go out to a farm alone and should bring a mobile phone with them. "There is a risk of flood waters and powerlines being down," he said. Mr Moran said if the early scenes developing in Cork "ripple through the country then we're facing an awful problem".